INDYCAR – “It’s a New Track Record”, PR Bluff or Potential Reality? Nothing tends to stir up a gaggle of Indy 500 fans more than hearing a recording of Tom Carnegie’s iconic pipes announcing another amazing feat of man and machine. Well, except that no new speed records have been set at Indy since 1996 maybe. 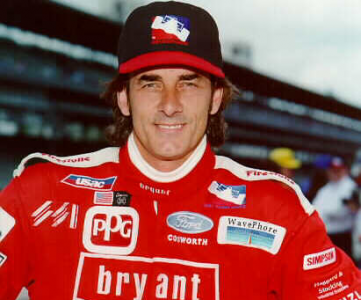 Arie Luyendyk set the single lap record at 237.498 mph and the four lap average record at 236.986 that year. And since then, there has been a constant dialog between fans, series officials and media about whether 237+ is safe at IMS for the drivers and the fans alike. During the IRL era, there was a concerted effort to keep those speeds down below 230. Enter Randy Bernard and his public comments at the PRI (Performance Racing Industries) trade show in Orlando. “I want the record gone. I want to start being very vocal about that so we can start making some changes. It’s essential for us. Fans want to see it. I get goose bumps even thinking about it. So, was this statement an attempt to grab the PR spotlight at the largest racing industry trade show of the year, or is there actual merit to achieving the goal in May 2011? Technically, there is no reason why a current spec IndyCar cannot be outfitted with a higher HP engine and have some of its mandated drag inducing elements removed so that it could top 237. Sadly, the motor racing world is all about going fast in a very limited framework of rules, and those rules in IndyCar, F1, Le Mans, Rally, etc see reductions in engine HP, introduction of drag elements, and limitations on driver aids every year, all in an effort to keep speeds down within what is considered a safe margin for their given discipline. HPD Technical Director Roger Grifiths has looked into the issue and claims that it should be fairly easy to do as long as they can use methanol instead of ethanol as a race fuel, and return to the 2003 engine design. Speed’s article on this says that they would “require a return to 3.5-liter engines and methanol instead of ethanol as a race fuel for the month of May” to achieve these lap speeds, but something does not add up with that statement since 2003 spec engine was 2.5L. The switch to ethanol in 2004 required the change to the current spec 3.5L engine since ethanol produces less BTU’s than methanol for a given volume and thus required larger displacement to achieve the same level of performance. Whatever the case, Honda has indicated that they would have to dig up enough 2003 spec parts to outfit the entire field in May with retrofitted engines, and then APEX Brazil would have to be appeased into allowing methanol for this one race. Definitely potential hurdles, but Randy Bernard has pulled plenty of rabbits out of his hat since stepping onto the IndyCar stage. So technically, it can be done. The fans (including me) want the speed records to return. Heck, many of the fans and media alike blame the lack of speed records as one of the reasons that IndyCar has lost so much of the public eye during the split. The only reasons that may keep the speed hunt from returning in 2011 is safety concerns and cost to the series/teams. Cost comes in when they negotiate out of their fuel deal and higher engine lease prices from Honda for the retrofitted engines. Safety though is the big issue. The IRL era kept the speeds down in an effort to preserve the safety of the drivers and the fans. Can it be done safely? That is not for me, an armchair enthusiast fan, to answer. But I would say that pressure from the Hulman-George ladies and a recognition that speed records were quintessential to the growth of IMS over the years has at least brought the safety issue under the microscope. There can be no question though, the faster the cars are going, the greater the force that will be carried into the wall or catch fence during a wreck. Will the fans be safe? Probably not much greater risk than when the Helio whipped it around on pole day at 228. Is the Dallara chassis capable of keeping the driver safe? I can’t answer that. I understand why they would like to do this on the 100 year anniversary of the first 500 mile race, but maybe 2012 is a better year to bring these plans back to the speedway. With the variable turbo boost on the engine allowing for tailoring the engine HP to the type of track (ie 500HP for ovals, 700HP for road street courses) it would be much easier to implement a different HP for Indy. Further, the cars are going to be lighter, so this will lessen the inertia slightly. Further, Dallara is consulting with Dr. Terry Trammel and past crash data to make the driver position in the cockpit and the driver protection better than ever. Last question. As much as people have heaped scorn on the current Dallara, do we really want to see it hold the track record for the next decade or so? Remembering back about a year ago, didn’t we mark this as one of the necessary goals of a truly revitalized Indianapolis 500 Mile Race? Honestly, I don’t think its truly possible for 2011, although we could see low 230s next year. The potential for track records really isn’t possible in a cost-effective way until 2012 with the new car. I remember reading an interview with Mike Hull of TCGR last year where he said that they’re not sure that they can keep the current cars inside the fence if they are going 240 at Indy. If that is truly a concern (and I believe Hull if he says so), I think that alone would put a damper on going for track records. However, I’m not sure the records need to fall. Helio qualified at 228 last year. What if they make some aero and engine improvements and get into the mid-230’s? I think that would bring a lot of excitement. When Helio went 228 last year, the place went nuts. I agree with you Henry, anything north of 230 will be awesome for 2011. I would welcome going for the track record, but only if the safety people ok it. It doesn’t relate to Indy and can only start an arguement, but this gets the blood pumping. Disregard my previous comment, my youtube link didn’t work out to well. Anyhoo, it was Gil de Ferrans 241 mph qualifying lap at Fontana from 1999. I say let ’em rip in 2012. Drivers know the risks and spectators need to read the disclosure on the back of their admission ticket.